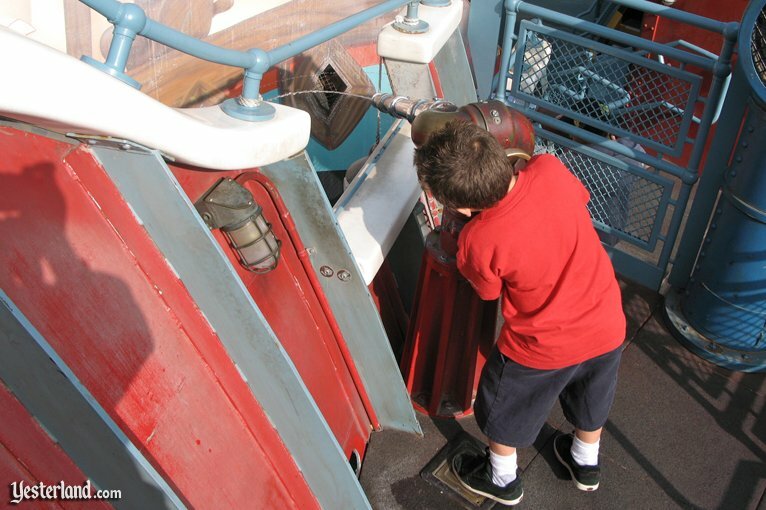 It’s an interactive, water-squirting fire boat! P.P.F.D. 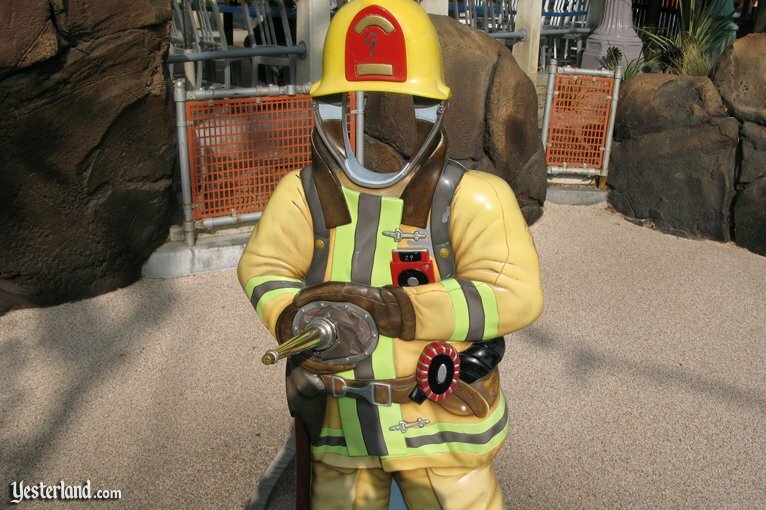 is the Paradise Pier Fire Department. The department has a fire boat, the S.S. rustworthy. 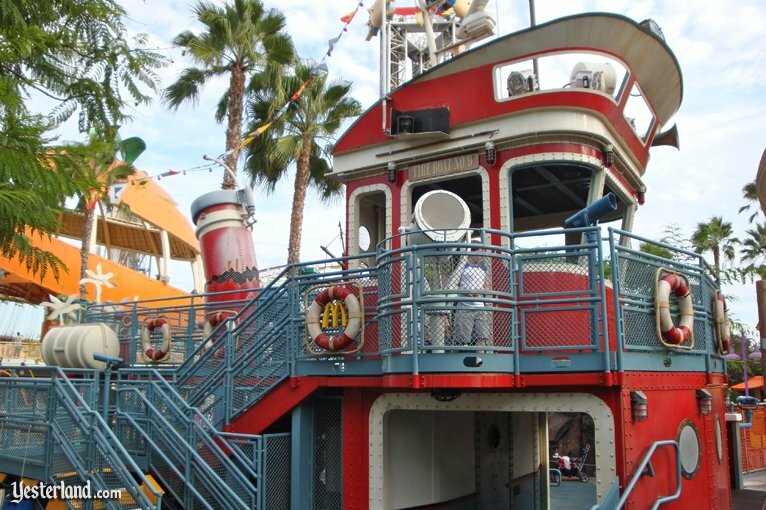 Let’s hope this boat isn’t needed to douse a fire on the amusement pier. The boat is a wreck. 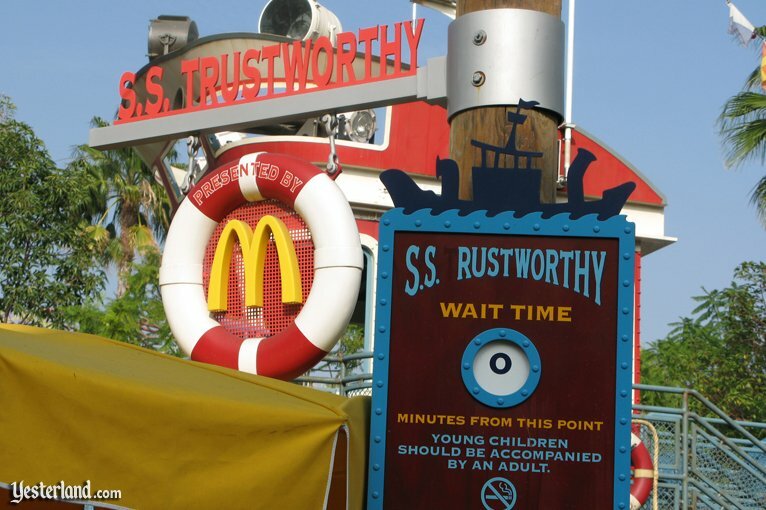 S.S. Trustworthy or S.S. rustworthy? S.S. rustworthy… what an odd name for a boat. That’s the official explanation of why the boat is here, how it got its name, and why there are kids playing on its decks. It appears the S.S. Trustworthy didn’t just run aground. The fire boat smashed into a rocky shore. It must have been quite an impact. In fact, the fire boat broke into two parts with a big gap between them. The main Paradise Pier walkway goes across the gap. Over time, various instances of the initial “T” of Trustworthy broke off, faded away, or were obscured by rust stains. 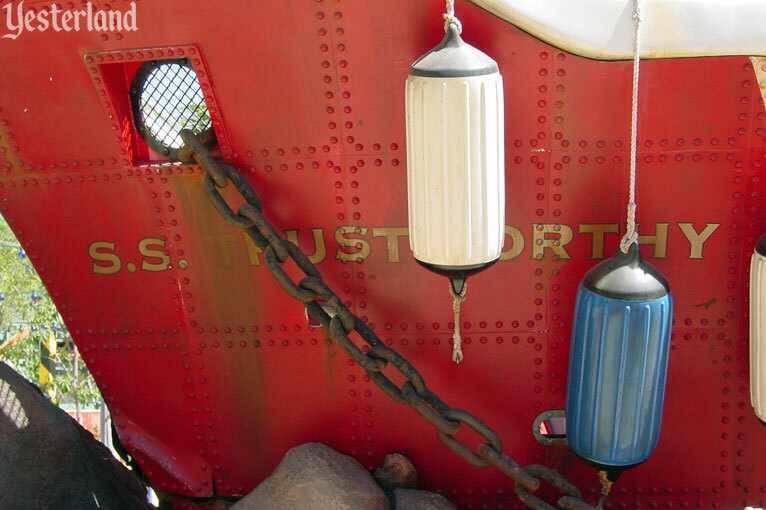 That’s how the S.S. Trustworthy became the S.S. rustworthy. 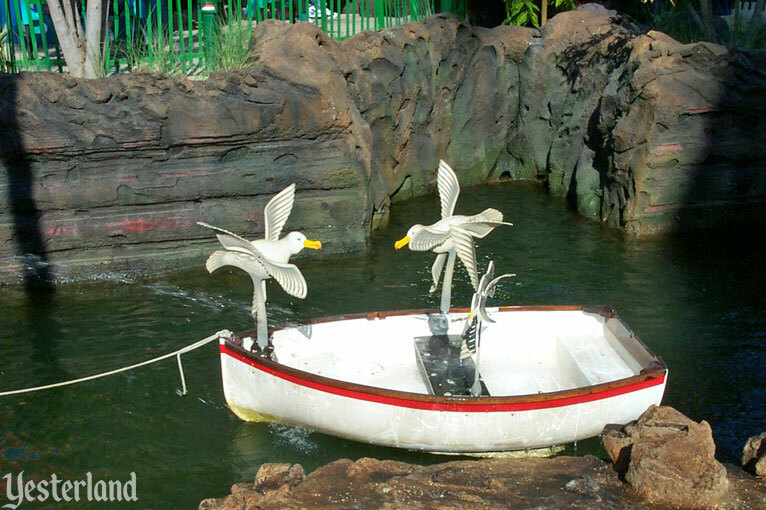 The S.S. rustworthy is even home to a pelican—a pelican with a hat. Its dinghy and buoys are home to seagulls. You can’t blame park management for the rust or the missing letter. These aren’t maintenance issues. The rust is part of the theme. 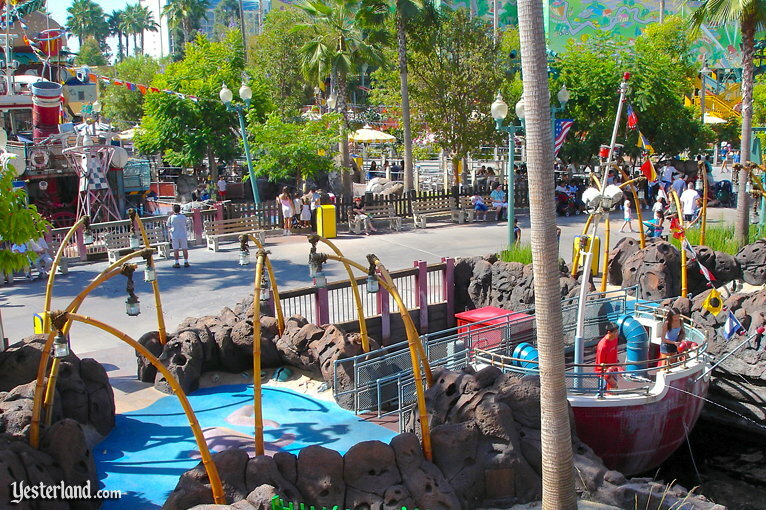 The name S.S. rustworthy is one of the many clever names at this park—such as Maliboomer, Malibu-Ritos, and Pizza Oom Mow Mow. Speaking of Pizza Oom Mow Mow, the surfers’ pizza hangout is nearby. But with Golden Arches logos all over the S.S. rustworthy, perhaps you have a craving for a Big Mac and fries instead of pizza. The good news is that Burger Invasion, Hosted by McDonald’s is right next to Pizza Oom Mow Mow. 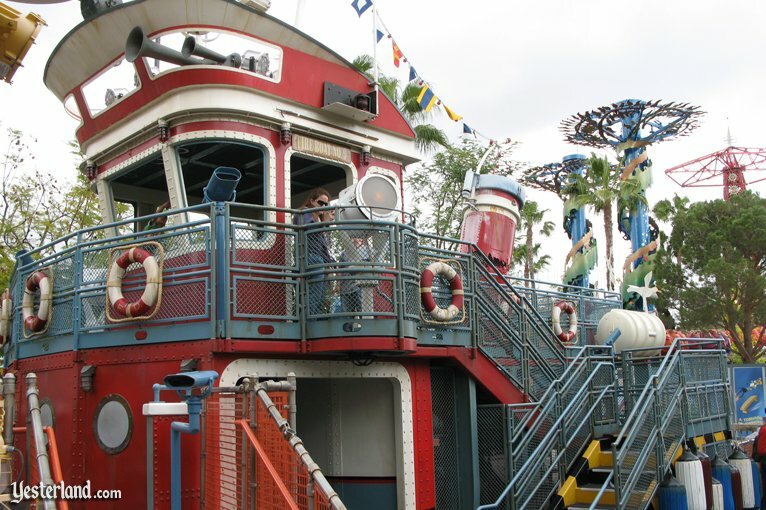 But first, head up to the wheel house on the second deck. Play with the controls that turn on lights, make sounds, and operate the radar. Ring the loud bell. Telescopes provide views of Paradise Bay. Yikes. 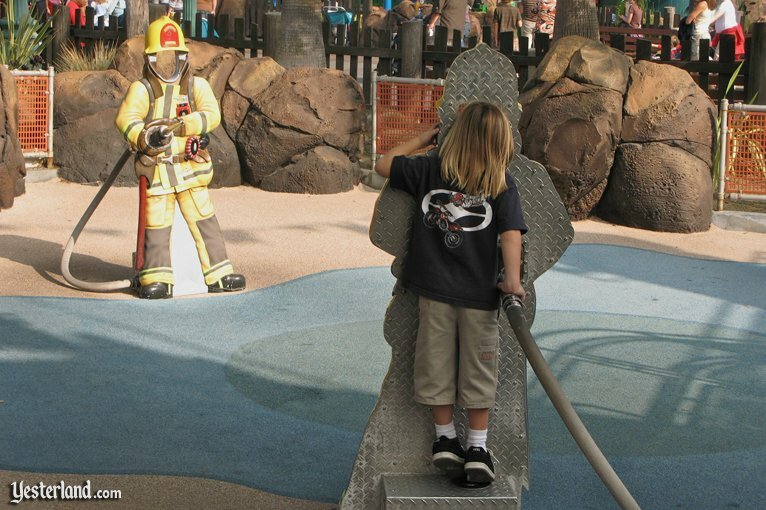 Why is there an invisible firefighter, wearing a uniform and pointing a fire hose? Actually, it’s one of two rigid firefighter uniforms facing each other. 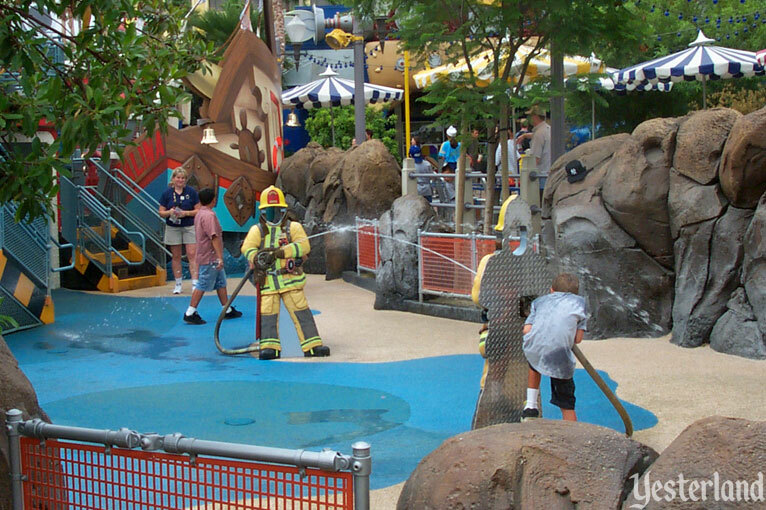 Two kids can squirt water at one another, with one kid behind each firefighter. The uniforms protect the kids—to a degree (they’re still likely to get wet). 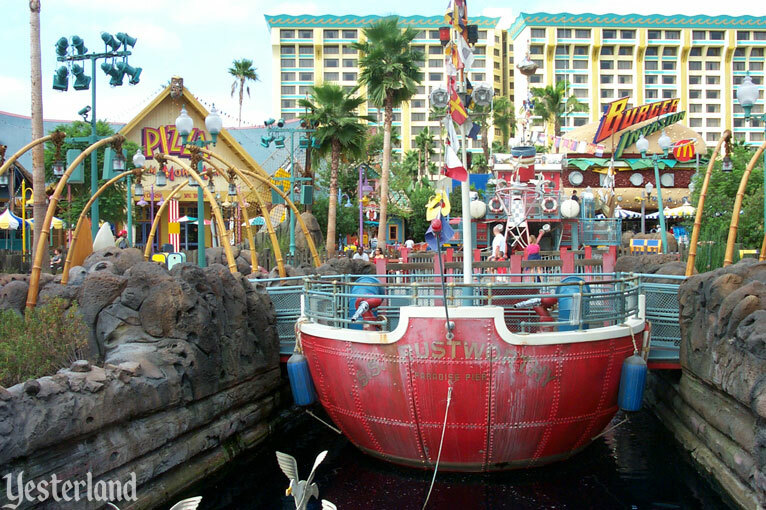 The S.S. rustworthy is all about squirting water. 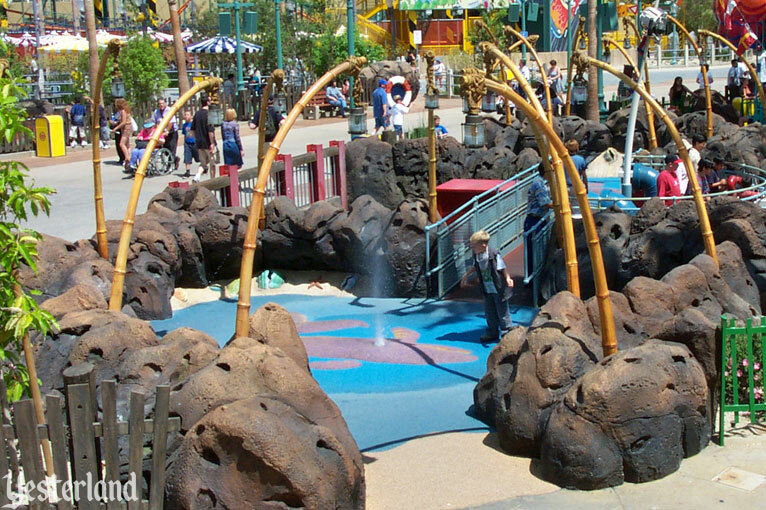 After all, this is a water play area. 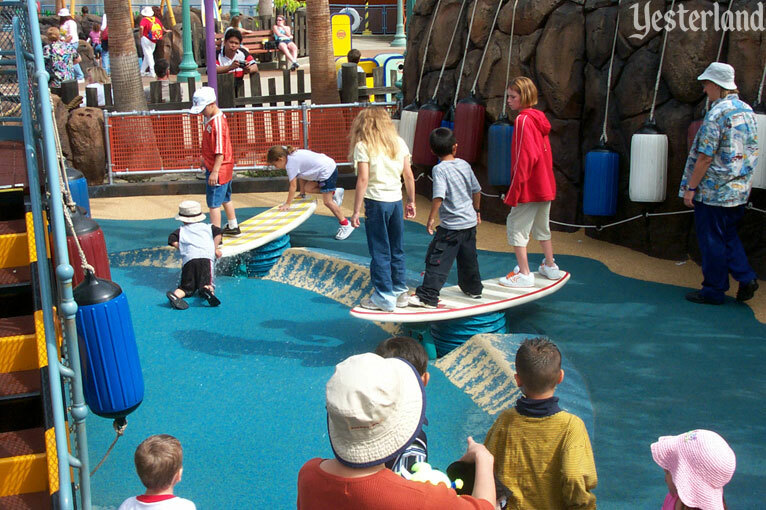 Pretend to surf on one of the spring-mounted surfboards next to the boat. As you rock back and forth, water squirts out. Stop for a minute and wait for an unsuspecting guest to walk in front of you. Then start “surfing” again to soak that guest’s shoes and pant legs. You might not get as wet as on a real surfboard, but you probably won’t stay dry. Did you remember to bring a towel? 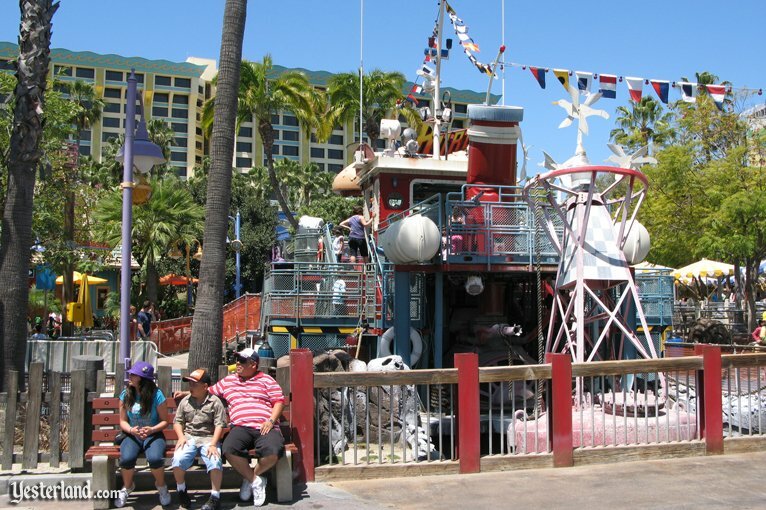 The S.S. rustworthy was one of the original attractions of Disney’s California Adventure when the Disneyland Resort’s second gate opened February 8, 2001. 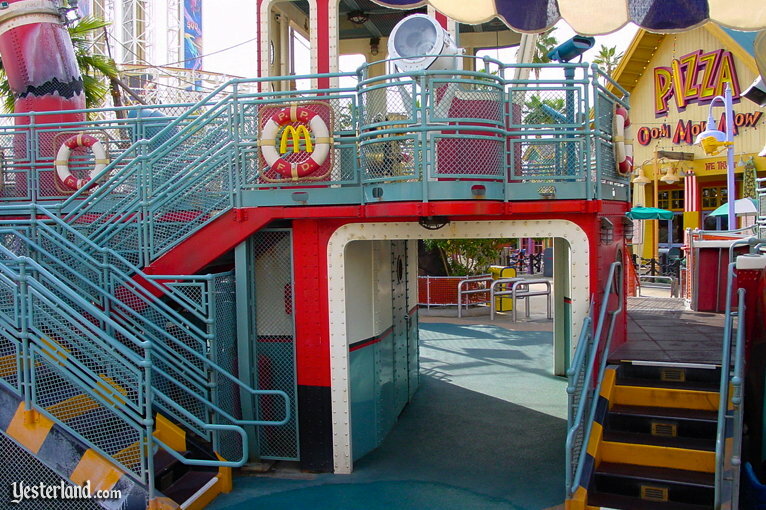 Considering that The Walt Disney Company and McDonald’s Corporation had a major strategic alliance at the time, it was surprising that McDonald’s only sponsored such a minor attraction at the Disneyland Resort. 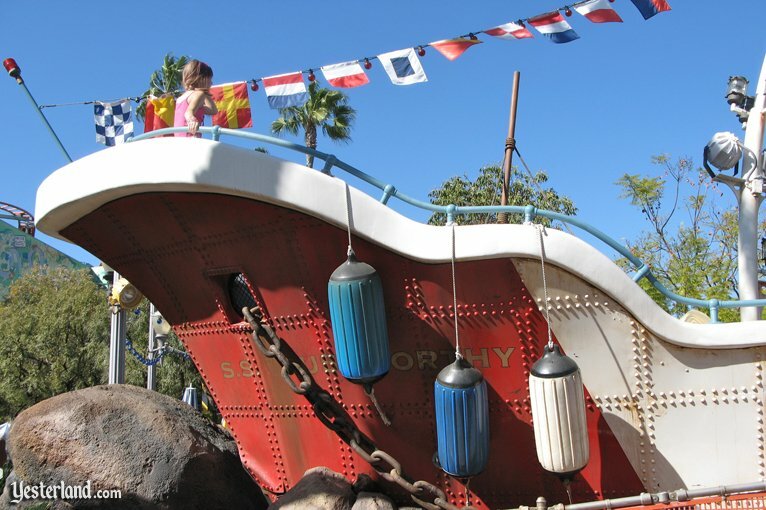 In a park that was criticized for having too few attractions for the young, the S.S. rustworthy was undeniably meant for children. 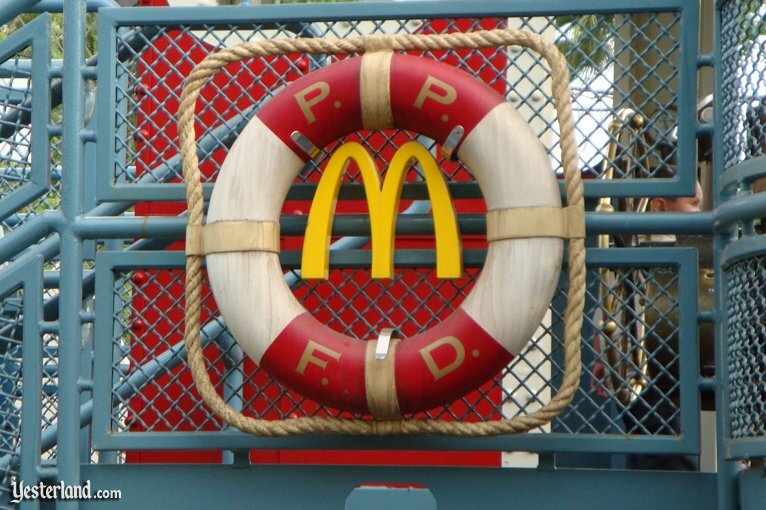 In September 2008, when the McDonald’s logo came off the Burger Invasion eatery, it also came off the S.S. rustworthy. The playzone no longer had a sponsor. Otherwise, for a year, the S.S. rustworthy remained unchanged. Oddly, the S.S. rustworthy disappeared in two separate pieces. In September 2009, the stern portion (which was the smaller part) was demolished. 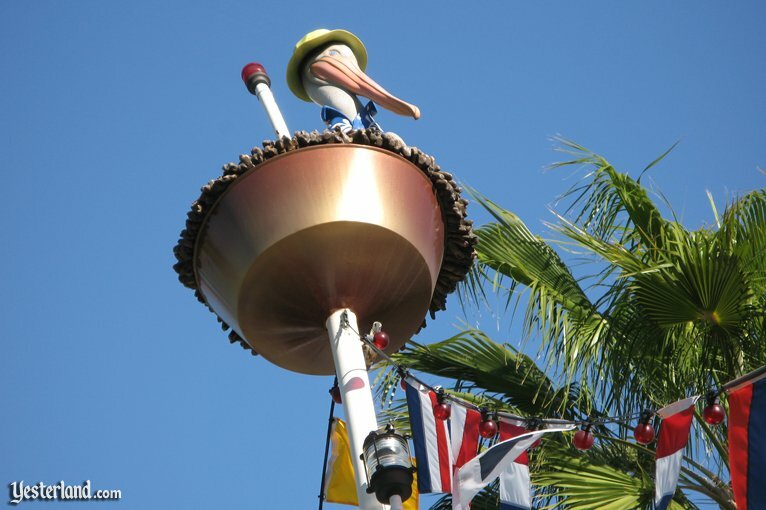 Nearby, the Orange Stinger was being transformed into the Silly Symphony Swings. 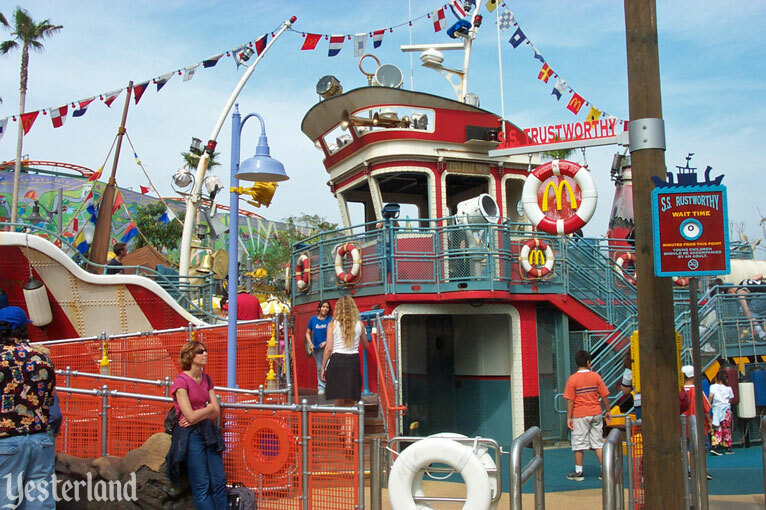 For another year, the fire boat had neither a sponsor nor a stern section. Few guests noticed. The two sections had been so far apart that it was never obvious from the ground level that they were part of the same boat. 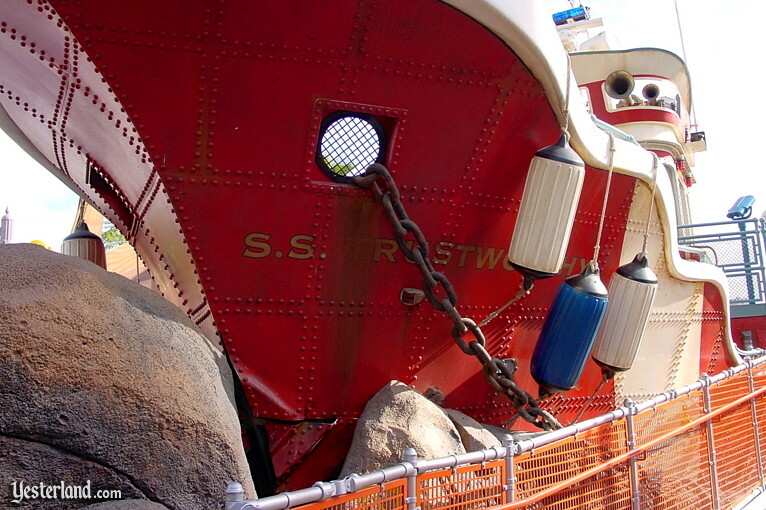 The main portion of the S.S. rustworthy disappeared in September 2010.